Andrew Adonis’s fixation on the salaries of vice-chancellors looks like one of Lynton Crosby’s dead cats. In practical terms, cutting the pay of VCs by 20 per cent would make a negligible impact on the sector. But it’s a nice, outrage-inducing, stinking carcass that distracts attention from more profound debates about higher education in the UK. Amidst all the alarmist rhetoric about excessive spending and student debt, it’s worth remembering where we are. 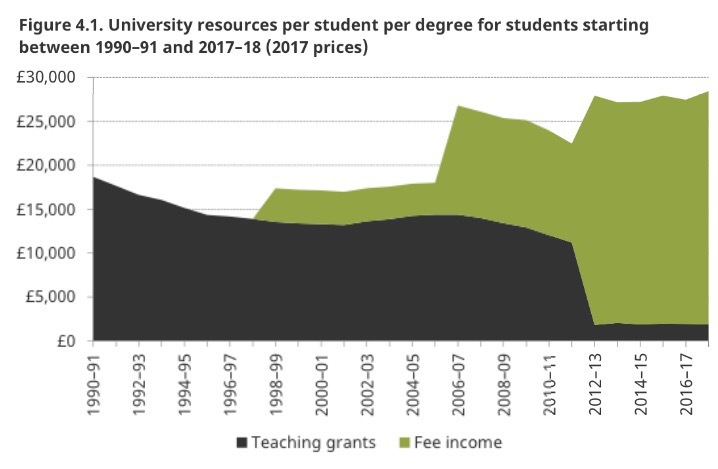 The increase in the maximum fee for home undergraduates in 2012 to £9000 was accompanied by a slashing of the level of state teaching grant: for most courses, to zero. Despite the expectations of the time, almost all universities set fees at the maximum level because degrees operate as positional goods. Price is perceived in this market as a proxy of quality, so it becomes irrational to go low. per cent. Since there was no inbuilt mechanism to adjust fees in line with inflation, however, the system begged questions of long-term sustainability from the outset. Hence the 2.8 % rise – the first since 2012 – this year. Overall levels of student debt have been affected further by government tinkering with interest rates, repayment rules and the abolition of maintenance grants. Many people can’t now see a problem. There is no credible evidence that the system is deterring students from lower socioeconomic groups. And while the headline levels of individual debt look bad, this is a ‘fee’ that operates more like a tax, balancing eventual cost with a individual’s financial benefit. Though some commentators may now resent it, the 2011 reforms lifted a world-class higher education sector out of the reach of austerity. Moreover, vice-chancellors would point to the high levels of competition, for student numbers and research funds. They would also stress evidence of enviably high quality, in terms of research and education. British universities rank well in all international tables – although they are under intense pressures from other countries now investing aggressively. The simplest solution – if we accept there is a problem – is to cut fees to zero but maintain current levels of funding. This appears to be what Labour had in mind at the last election. But you could write that on a bus and it would still look like wishful thinking. No government could afford it, least of all at the present time. Nor, if we listen carefully, is this what many of today’s most vocal critics want. Adonis suggests cutting the maximum fee, so that the state pays no more and the sector is returned roughly to 2011 levels of funding. This sounds simple, but the impact on quality would be devastating. With few other flexible lines of spending, and often high levels of debt, universities would be forced to cut staff numbers, increase class sizes, decrease contact-hours, and downgrade their research mission. Fine, says Adonis: universities are spending too much time on pointless research anyhow, and can balance their books by taking more international students. But this strategy is so laden with risk that it borders on delusion. International students make rational decisions in a fiercely competitive market. Any policy that undermines overall funding levels, or risks our position in international league-tables – heavily dependent, as they are, on research performance – puts our position in this market at risk. Arguably the only alternative would be sweeping structural changes, with much more state intervention. That might mean strict tiers of institutions, priced accordingly. It might also mean a concentration of research resources in a handful of universities. There are models for such an approach internationally. It’s an elitist structure, but there’s an awful lot of elitism under Adonis’s faux populism. Structural change like this may look deceptively easy from a distance. Funding can be cut, student numbers slashed, preference given to STEM subjects (since, we’re assured, that’s what the country needs). But damage would be done. The strength of the UK system is founded on its diversity: a fact documented in both the Research Excellence Framework and the Teaching Excellence Framework. Universities that are low in league tables provide important specialist degrees and contribute enormously to regional economies. Which ones do we want to close? Populist campaigns like this one can take unpredictable turns, especially when a government is weak and distracted. It might just disappear after the stench of dead cat has lifted. If not, it can only be hoped that everyone involved recognises the world-class quality and diversity of UK higher education. If we’ve learned anything from Brexit, it’s that before we smash something that works, it’s a good idea to have thought about alternatives. *slightly longer version published earlier on wonkhe. Written and published entirely on my phone, so apologies for clumsy formatting. In terms of closure, the universities which should be prime candidates are the ones which have over-expanded, irrespective of status. The issue I have with this blog is that is is micro-obsessed with recent data (“show me the date”, “where’s the evidence” etc). Whereas people who have stepped back from higher education, and journalists like Mary Dejevsky, have seen the bigger picture, which screams higher ed bubble (Big Ed). Micro-data, from the recent past, is largely redundant; a turkey has been fed all year, it will expect on historical data that this will continue to be the case, but christmas is around the corner. Blaming the government, blaming the xenophobic brits, retweeting The Guardian, none of these things will help to address the fact that Big Ed has overexpanded to monstrous proportions. For this the blame lies both with government policy (which has been terrible) but also with individual universities, who have decided to grow at any cost in order to compete (or increasingly, eliminate the competition). This process would have continued irrespective of tuition fee rises and the withdrawal of state funding, I believe. You can throw back stats on other countries’ tertiary education levels, compared to the UK, but the fact is most of those countries retain a strong vocational college network; whereas the UK scrapped the polytechnics. I will go against the grain and make another prediction – many of the universities which will go under will not be from the bottom of the league table, but from the Russell Group. These are notable for their debt-levels, and I believe Exeter is no exception on this score. Steve Smith’s recent interviews in the local papers (“I’m responsible for the Exeter housing market” etc) point to a very high level of hubris, which often proceeds a major crisis. In summary, Big Ed is a Short, and the Russell Group (other than Oxbridge) is a major Short.